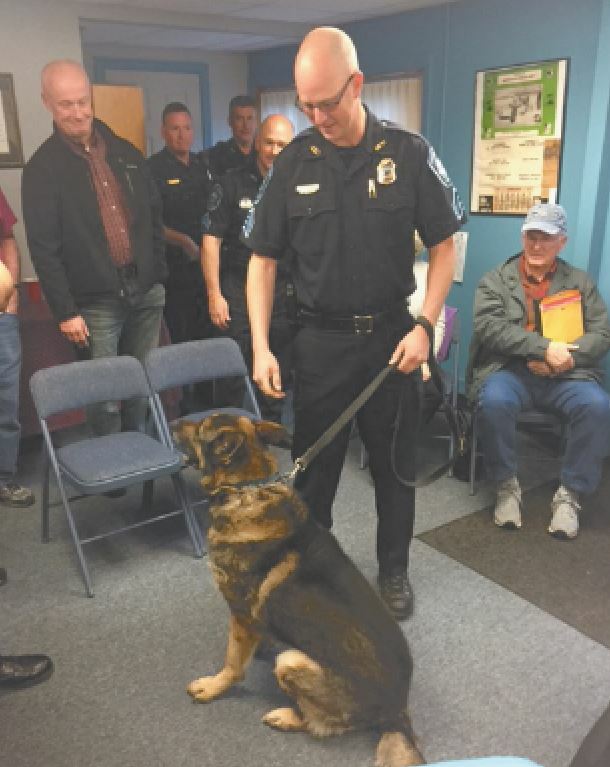 A retirement party was recently held for Gunny, a member of the Merrimack Police Department’s K-9 unit. Sargent Greg Walters is shown with Gunny, who has his eye on a cake. Merrimack Crimeline will host its 19th annual Golf Tournament Wednesday, Sept. 13, 2017. This is their major fundraiser for the year. If you would like to be a sponsor please contact Officer Rob Kelleher at 424-3774 if you have not been contacted by one of the Crimeline members. Sponsorships range from $50 to $1,000, raffle prizes are also accepted. On Saturday, April 8, the performances of the Granite State Magicians to benefit the K-9 program for the Merrimack Police Department were entertaining, nonstop magical fun for Merrimack residents. The Merrimack Crimeline and the Merrimack Police Department would like to thank the GRANTE STATE MAGICIANS and all who attended the event and those that made personal donations. We would like to also extend our thanks to the many local businesses that displayed the flyers. The raffle was a great success, as were the hot dogs, popcorn and drinks for sale. Pet’s Choice, which sponsors food for Dallas, the Merrimack Police Department’s K-9, had representatives there to answer questions and support the benefit. Dallas and Officer Stephen Wallins made an appearance with a K-9 demonstration. A check presentation for $2,405.29 was made on May 13, during the Merrimack Police Department open house. A tentative date for the 10th annual magic show is April 14, 2018. Total presented to the K-9 program for the nine years is $14,735.02. A retirement party was held recently for another member of the MPD’s K-9 unit, Gunny. Gunny was purchased from Compatible Canine Services out ofÃÂ Brookline,ÃÂ Mass.,ÃÂ for $5000. Gunny is male (not neutered) approximately 20 months old, sable in color. ÃÂ Gunny came with some basic obedience training, bite work and retrieval skills. He is guaranteed to pass the Canine Patrol and Narcotics and to be free of any genetic health defects for one year. Gunny and Sargent Greg Walters attended and passed theÃÂ BostonÃÂ PatrolÃÂ CanineÃÂ School. They graduated on Dec., 18, 2009. The school was 14 weeks long; Monday through Friday. Currently, the duo is certified as a K-9 team for in the following areas: building searches, tracking, evidence recovery, obedience and apprehension (long bite, vehicle deployment and deployment with gun fire, outing with verbal commands). Working towards being certified in USPCA, PB1 and IPWDA, these certifications are similar to Boston Police Department certifications, but the more certifications the K-9 team has, the better credibility the team will have testifying in court. With the completion of the patrol school K-9 teams are 70 to 80 percent proficient. Walters and Gunny trained daily to maintain and increase the proficiency level. The skills learned are perishable for both Gunny and Walters. During the shift, they train a minimum of 30 minutes a day. It takes approximately one year to be fully trained if the daily training is continued. To assist with this Walters and Gunny trained with Boston Canine twice a month. This allows the K-9 instructor to continually evaluate the K-9 team and work on any areas of improvement. Training locations are inÃÂ Massachusetts, in the following towns:ÃÂ Danvers,ÃÂ Arlington,ÃÂ Chelsea, Long Island (inÃÂ Boston), Jamaica Plain,ÃÂ Wilmington,ÃÂ Bellingham,ÃÂ New Bedford andÃÂ Dartmouth. The use of different places challenges the K-9 team with different environments. ÃÂ Types of sites used include old schools, Brigham Ice Cream Factory,ÃÂ SuffolkÃÂ CountyÃÂ TrainingÃÂ Building, office buildings, farm fields, woods, swamps and industrial parks. The pair worked during all weather conditions, day and night. ÃÂ Walters also learned how to decoy police dogs. By learning to decoy dog the handler gets an appreciation of how a real bite from a dog feels and how the dogs target and hold. Statistically handlers that decoy dogs have a lower bite ratio. The duo used bite sleeves and bite suits. The dogs were taught to target by themselves where the apprehension would take place. To date The K-9 team has done three tracks. At Cinemagic, Gunny tracked the locations of a getaway car and the place where a bad guy laid in the snow waiting for the employees to come out. On the last track, Gunny located a victim’s cellphone that had been taken at the robbery and later discarded. Also this year, Crimeline donated license plate frames for Merrimack Police Department vehicles. Crimeline members also have purchased frames for their personal cars. The read 603-424-2424 on the top and merrimackcrimeline.org on the bottom.